izmoIndY is a new Platform-as-a-Service technology (PaaS) from izmocars that speeds the time of application development and deployment, provides car dealers with single sign-on capability for IndY enabled applications, and allows data sharing between applications in a highly secure operating environment. izmocars, the leading Internet business solutions provider for the automotive industry that helps dealerships sell more cars while also streamlining cost for every department in the dealership, today announced the launch of izmoIndY, its new web-based operating platform for automotive digital marketing. izmoIndY is a new platform-as-a-service technology (PaaS) from izmocars that speeds the time of application development and deployment, provides dealers with single sign on capability for IndY enabled applications, and allows data sharing between applications in a highly secure operating environment. Applications like website management tools built for izmoIndY will therefore enable dealers and OEMs to build a fully featured online store for a fraction of the time and cost of most dealer websites today. “izmoIndY addresses two of the most important aspects of dealership operations today – dealer site management and digital marketing,” said Tej Soni, President of izmocars. “izmoIndY gives dealership management complete control and flexibility to set or change role definitions to suit their business needs while its cutting-edge technology supports the rapid development of an entirely new class of automotive applications,” he pointed out. IndY products will come with a complete set of role definitions that most dealerships need, dealers can change these definitions to suit their business needs and the changes will automatically be applied to all IndY enabled applications, giving the dealership management the power to define what individual dealerships or regions can or cannot change. Gives the ability to share inventory, specials, job postings, and staff information across any combination of websites within a group. Gives your customers the ability to filter and search by multiple parameters like engine, transmission, drive train features in addition to standard parameters like year, make model, trim, body style, price, color and mileage. Gives complete freedom to change the template design within minutes. Campaigns can be created using a rich set of templates for e-mailers, banners and landing pages, which can be further customized. izmocars is a leading provider of Automotive Business Solutions including: Website and Online Marketing Solutions, Enterprise-level Automotive CRM, iConsult - Sales Performance Coaching and AddOnAuto - an In-Store Accessories Sales Solution. izmocars is also the world’s leader in Interactive Media Content for the automotive industry. 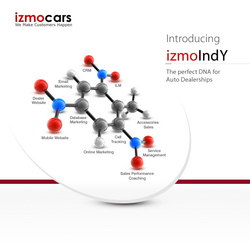 Founded in 2002, izmocars services some of the most successful eDealers in the country. izmocars is based in San Francisco, with offices in Long Beach, CA, Chattanooga, TN, Philadelphia, PA, and Brussels in Europe.